Read-out Instrumentation Signpost: Non-contacting angle encoders. Two non-contacting models have been added to Variohm EuroSensor's wide range of high accuracy angle encoders. Both are from their Swiss distribution partner, Contelec AG, and feature separate magnet and sensor components for continuous rotation in a two-part design that requires no mechanical bearing or joint - and with no wearing parts and IP68 protection class, they offer an effectively limitless mechanical working life. 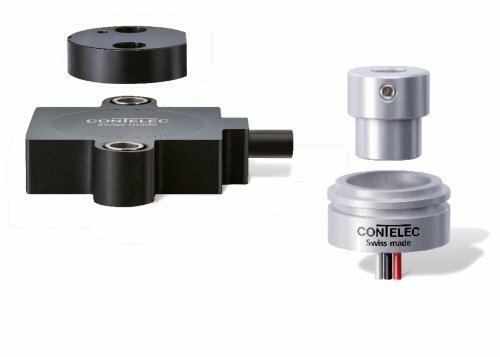 Whilst these angle encoders offer a wide choice of extreme environment application solutions for precision angular measurement, they are differentiated by their respective housing designs. The Vert-X-31E has a flat moulded plastic sensor housing with 38 mm fixing centres that suits installation in height constrained areas whereas the 22 mm diameter cylindrical aluminium housing of the Vert-X-22E will suit placement in cramped areas where radial space is severely restricted. The sensors have a standard 360⁰ electrical angle with the possibility of factory-set custom angles - normally in 30⁰ increments although special angles may be supplied for OEMs. For certain electrical output models, user-programming with Contelec’s easy-to-use ‘Commander’ software provides convenient application adaptation of output characteristics such as angle range, index points and direction of rotation. This flexibility can also benefit end-users by a reducing the number of uniquely specified angle encoders required for a particular machine application. User programmability is also advantageous for minimising customer stock levels and makes field replacement more straightforward. Vert-X22E output options include ratiometric, voltage, current, PWM and SPI from 5V or optionally 24V input. The Vert-X31E includes all these output and supply options as well as SSI and incremental encoder. Throughout these options the resolution is typically between 12 and 14 bits or up to 1024 PPR for the incremental version. Some output types also include dual redundancy for added safety. These high accuracy angle encoders have a typical independent linearity in the range of +/- 0.3% to 0.5%, depending on model and output type. 1 metre length cable connection is standard with customised lengths and special connector options available on request. There are also a number of different magnet types that complement the numerous installation possibilities. User benefits offered by the two-part magnet and sensor housing design of the Vert-X-E series non contacting angle encoders extend to simplified installation with the possibility for a magnet to sensor air-gap of around 13 mm for single channel models. Operation is also possible through a solid non-magnetic wall. The design also allows a small measure of tilting and radial misalignment. An optional feature for some models that will allow detection of magnetic loss will signal a system shut-down in case of inadequate magnetic contact. The IP68 sealed components for both models offer exceptional levels of reliability and endurance as well shock and vibration and, in particular for the fully encapsulated 31E, an outstanding resilience to humidity, damp and dust. The two-part design has been extensively proven in use for steering, guiding or angle position on heavy duty machinery such as agricultural, mining or construction equipment, and other applications where extreme environment conditions exist and accurate measurement is required.